Cozy small cabins with 2 beds in one Bedroom (in addition to a sofa bed in the living room). A small kitchen, 1 bathroom and a living room. 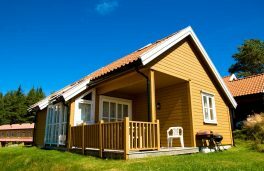 The Cabins have a nice location, a own terrace and direct access to the lawn. Some Cabins have a nice view towards the sea. A BBQ place and a playground are right outside the Cabins. Free Wifi. The Cabins have duvets and pillows. Bed-sheets, towels and the final cleaning are included in the price. 60 sqm apartment with 6 beds in 3 different bedrooms and a sofa-bed for 2 people in the living room. 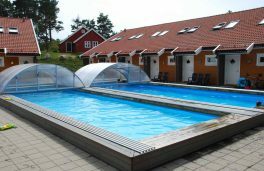 The apartments are located around the pool-area, which is heated during the summer season. The apartments have a well equipped kitchen, living room, bathroom and a patio. Free Wifi. The apartments have duvets and pillows. 100 sqm apartment with 10 beds in 4 different bedrooms. Sofa-bed on the 2nd floor can accommodate for 2-4 extra persons. The location is on the pier with a nice view over the sea. The apartments have a well equipped kitchen, a living room, a bathroom and a balcony. Free Wifi. 60 sqm apartment with 6 beds in 2 bedrooms. The location is on the pier with a nice view over the sea. The apartments have a well equipped kitchen, a living room, a bathroom and a terrace/balcony. Free Wifi. 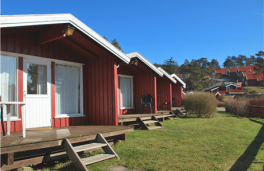 80 sqm cabins with 6 beds in 3 bedrooms + 2 beds on the loft. Two of the bedrooms have a double bed. 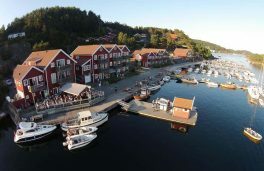 The cabins have a nice location on a ridge, with a beautiful view over the fjord and the southern archipelago. 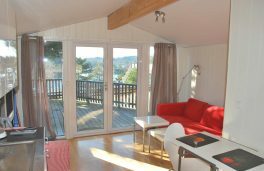 The cabins have a well equipped kitchen, a living room, a bathroom and a terrace. Free Wifi. 50 sqm cabins with 8 beds divided in 3 bedrooms, a living room, a well-equipped kitchen, a bathroom and a large terrace. 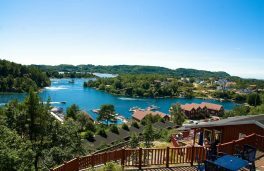 The cabins are located on a ridge with a nice panoramic view over the sea. Free Wifi. 50 sqm apartment with 4 beds divided in 2 bedrooms, as well as a bathroom, a living room, a well-equipped kitchen and a terrace. All apartments are located on the pier in building A, above the restaurant. Two of the apartments have a nice view over the sea. The third one is without sea view, but has great evening sun. Free Wifi. The apartmens have duvets and pillows. The cabins have 4 beds divided in 2 bedrooms (in addition to a sofa-bed in the living room). The cabins have a kitchenette, a living room and a bathroom. 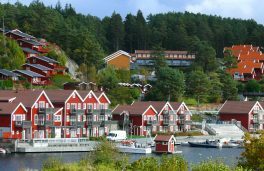 They have a nice and open location with a terrace and most of the cabins also have a nice sea view. A Barbecue area and a play area are close by. Free Wifi. Ready-made sofa-bed for the price of NOK 350,- per person.